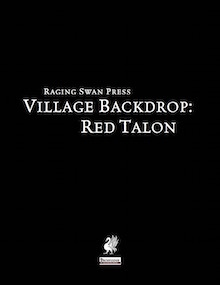 It's not a Parsantium book, but if you like my stuff, why not check out Village Backdrop: Red Talon, the pirate village I wrote for Raging Swan Press? Huddled in a sheltered cove at the base of lofty cliffs, the tiny village of Red Talon is inaccessible by land for all but the best climbers. Its folk are insular and vague rumours lay cannibalism and devil‐worship at their door—with good reason. Founded by the vicious pirate captain Hagruk Stormrider Red Talon hides a vicious, depraved cult dedicated to the unholy, cannibalistic worship of the little-known Ukre’kon’ala. Adventurers often come to Red Talon—not to battle the hidden cult—but for the pirate booty said to lie in the waters just off the coast. Twenty years ago, Hagruk and his entire crew went down with his ship and now rumours of glittering treasure yet lying among the wreck of his galleon bring many to the village. Few leave… Village Backdrops are short, richly detailed supplements that each present a single village ready to insert into almost any home campaign. Perfect for use as a waystop on the road to adventure, as an adventure site themselves or as a PC’s home, Village Backdrop present the details so the busy GM can focus on crafting exciting, compelling adventures. You can also read an extract at Raging Swan's site.